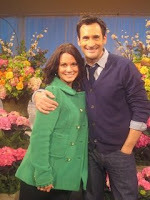 We created a beautiful spring set for the KTLA morning show today for the segment on Spring Fashions with Lawrence Zarian. Lawrence presented the opportunity to us, and trusted The Hidden Garden would impress the audience watching. 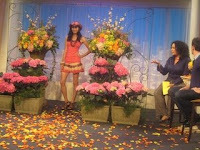 The set was fashioned with beautiful and vibrant spring flowers and colors. We chose to frame the area with all sunshine yellow, tangerine orange, lime green, and vibrant pink. The wrought iron gates created an entrance for the models, with a garden setting of urns and planter boxes filled with roses, hydrangea, cymbidium orchids, & blossom branches. 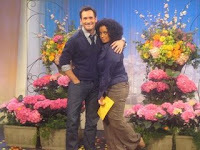 The staff and crew at KTLA were amazed with the flowers! Thanks Lawrence Zarian for introducing us to the KTLA team! 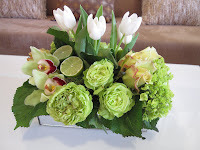 I had the opportunity to be a part of an interview with Susan Fogwell from the NY Floral Design Examiner. 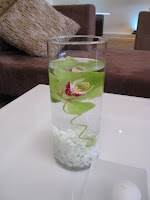 She focused on the celebrity clientele we've been able to work with, which was fun. Click here to take a look at the article... and learn something new about me today! We have just started to see our first signs of lilac. 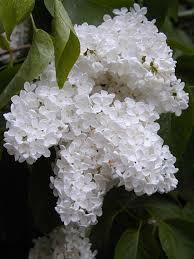 Everybody loves lilac and it's beautiful scent and perfect look. We'll have purple and white lilac for the next 4 weeks, so get it now... before it's gone. Lilac is only with us for a short while, so don't miss out. We have blogged about floral designing classes in the past but yesterday we had the cutest floral design students ever.....The Middle Cranberry Class from Bel Air Pres Preschool! Now, I must admit that I am a little partial to this crew since my son, Zachary, is in the class. 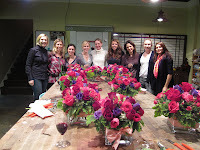 Either way it was so adorable to watch these budding floral designers in action. 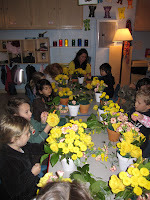 The kids had a great time learning how to arrange flowers like a pro! The Hidden Garden brought all the supplies needed for the class. 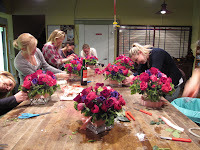 Each "designer" had their own terra cotta pot (prepped & ready to go), cut stems of flowers and some scissors. We placed all of the flowers (roses, mini carnations and button mums) in the center of the table and let them take over! One day they might just be working at the shop! Have you ever wondered, "how can I design my dinner table to look simple, casual but like a pro might have arranged it?" It's sort of a contradiction when a client calls in an order and asks us to design an arrangement but at the same time they want it to look like they might have arranged it themselves. What they are really trying to say is "I want an arrangement that isn't over the top but simple and elegant as if i might have been able to do it myself!" We recently designed a luncheon table top for a client who was looking for that simple, casual and fresh look. Last night The Hidden Garden had the opportunity of providing the florals at the opening of The Mark for Events in Los Angeles. The Mark is a new location that provides a new and unique spot to hold a variety of events, from Bar/Bat Mitzvahs to Weddings and Corporate Parties. The interior of The Mark can be transformed many different ways to accommodate the look you are trying to create. 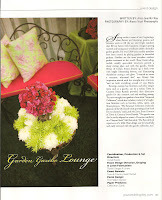 Poko Events brought in a variet of different furniture groupings to help create a more loungey vibe. 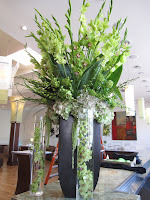 The Hidden Garden used a mix of all different monochromatic green flowers, including: roses, hydrangea, viburnum, gladiolas, cymbidium orchids, dendrobium orchids, bells of Ireland, grasses, and leaves with an accent of white tulips. The look and feel of the event last night was more of a modern and sophisticated look, yet fun. 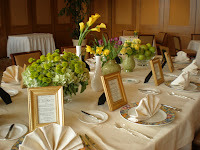 This past weekend The Hidden Garden had a beautiful bridal shower at The Montage in Beverly Hills. Their Conservatory Room overlooks the city and a picture perfect setting for any private party. The hosts of the shower, her mom & aunts, wanted to create a gorgeous herbal garden vibe with the decor. The centerpieces were designed in a soft lavender satin box filled with an array of rosemary, lavender, ranunculus, geranium and statice. Each flower was grouped mono botanically to make it appear as if this garden might have actually grown this way! 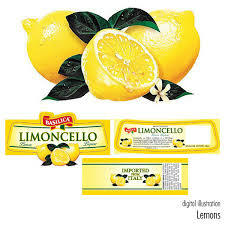 The menu cards were designed with a butter yellow paisley print and an antiqued lavender font. The soft gold tone linen and a square shaped butter yellow charger were the perfect compliment to the rest of the decor. As a special gift, each guest received an antiqued garden pot filled with an herbal plant (rosemary, lavender or thyme) with their name and table number inscribed so they knew were they were seated at the luncheon. At this meeting, is also a good time to go through the entire proposal again to ensure all the details are still accurate. While the flowers are in front of you, it's easy to envision the detailed and smaller things such as the boutonnieres & bouquets. This may be the last time you meet with the florist before the wedding, so feel comfortable discussing anything that's on your mind. 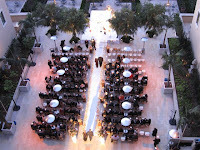 This weekend we had the opportunity to do our first wedding at the brand new Montage in Beverly Hills. 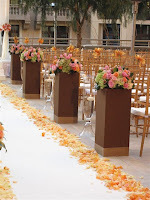 The ceremony took place on the beautiful architectural terrace, with the reception in their main ballroom. The bride was very special to us, so we wanted to make her day perfect. Suzanne envisioned beautiful tones of soft pink, mango orange, soft yellow, raspberry, and amber orange. 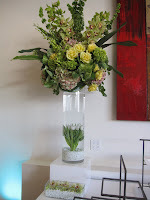 We incorporated a variety of different roses, hydrangea, tulips, and cymbidium orchids. Here are some pictures of the ceremony area... more photos from John Solano to come of the reception, bridal party flowers, and additional ceremony shots. To start, in the ceremony area, we softened the terrace level with ambient lighting from Images by Lighting, and pepper berry trees to frame the ceremony area. The chuppah was a soft, simple and romantic structure with ivory sheer curtains and beautiful floral tie backs to compliment the wedding colors. 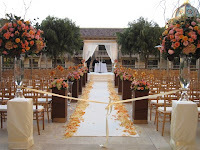 The aisle was adorned with mixed colored rose petals atop an ivory fabric runner. The sides of the aisle had alternating square pedestals with beautiful arrangements (that would later be reused as centerpieces) and tall glass vases with floating candles. The entrance to the aisle had 2 more dramatic and full floral display to create a focal point to rest of the ceremony area. The terrace looked beautiful, and the family was more than thrilled! So whether you want to get the girls together "just because", host a bridal shower, celebrate your birthday or just want to know "how do they do that? "....give us a call and we can set up a session today! 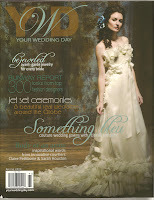 We received the newest copy of YWD (Your Wedding Day) magazine with the article and images of a photo shoot we did with Nicole Hirsty from Cobalt Events. 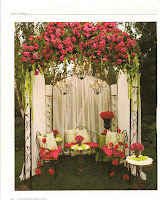 The theme was Garden Gazebo Lounge, to create a french inspired floral design. The color palette was all magenta, lime green, and white tones. 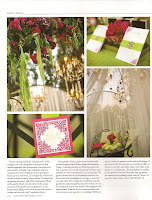 Tabella Designs & Linens provided the fabric treatment, specialty cushions/pillows, and the chandelier to finish the look. Did you know that it is almost Daffodil time!! This week The Hidden Garden saw a few bundles here and there at the Los Angeles Flower Market. By next week and the following...they will be in abundant display for you to purchase. The nice thing about Daffodils is they are inexpensive yet impactful. Their bright, cheery and vibrant yellow palette can make any room come alive. 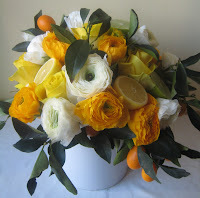 So when you are at your nearest flower boutique or grocery store, pick up a bunch and add a little sunshine to your day!